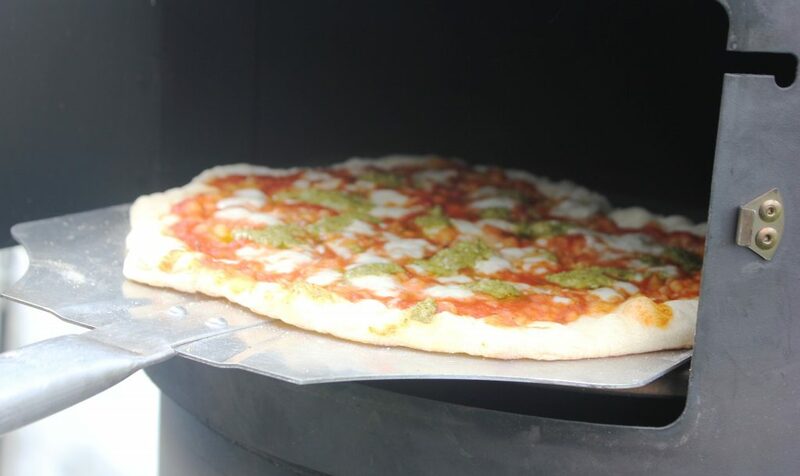 A delicious rustic pizza with a thin and crispy base that is a must for any pizza lover. 600- 800 ml hot(ish) water from the kettle. Put all the dry ingredients into a bowl and mix together. Make a well in the centre of the dry mix. Pour the olive oil into the well. Add the water into the well in small amounts and knead together until smooth and incorporated. Knead dough until it is firm on a clean surface sprinkled with flour. If you have added too much water, add some more flour to the mix. Cover with a tea towel and prove in a warm place for 1 hour until the dough has doubled in size. Knead the dough on a surface with a sprinkling of flour, knocking out the air. Roll out a hand sized ball of dough for a 12″ pizza. Sprinkle some polenta on to a pizza peel and place the rolled base to top. (This ensures the base will not stick as you slide it on to the stone). Add the tomato sauce base and any toppings of your choice. Heat through and leave to simmer until sauce thickens. Stir occasionally. Let the sauce cool down before using – this prevents the dough from becoming sticky. Spread over the pizza base leaving a 1″ space around the edge. Light the stove with dry wood or charcoal. for pizzas to cook perfectly the stove needs to be at a high temperature. When the heat has settled, slide the pizza onto the hot stone. This is important in order not to burn the base. Or cool the stone down with a damp cloth before cooking the first pizza. Leave for 2 – 5 minutes until the toppings are bubbling. Use the pizza peel to remove it from the stone, cut in to slices and enjoy!